On Christmas Day in 1893, every man, woman and child in a remote gold mining town disappeared, belongings forsaken, meals left to freeze in vacant cabins; and not a single bone was ever found. One hundred thirteen years later, two backcountry guides are hired by a history professor and his journalist daughter to lead them into the abandoned mining town so that they can learn what happened. With them is a psychic, and a paranormal photographer—as the town is rumored to be haunted. A party that tried to explore the town years ago was never heard from again. What this crew is about to discover is that twenty miles from civilization, with a blizzard bearing down, they are not alone, and the past is very much alive. Okay, so this synopsis hooked me right away, and the idea of a totally abandoned ghost town and a search for what really happened made me need to buy this audiobook when I saw it was on sale. Add to that the fact that I really enjoyed the show based on the author's book series, Wayward Pines, and I just knew I was in for a treat. While I will say that the audiobook was good, it was definitely nothing like I was expecting. The story goes back and forth in time, between the Christmas of 1893, when Abandon was a struggling little town still occupied by its townspeople, and 2009, when a small group of people (the ones described in the synopsis) set off to explore Abandon and to try and figure out what really happened in 1893. The history professor is an expert on the town and it has been his life's mission to not only discover what happened but to see if he can find a cache of gold bars rumored to have been in Abandon when everyone left. This back and forth style was excellent as the author often left off on a cliffhanger of sorts between switching timelines, keeping you drawn into the action and drama, while also advancing both stories at an interesting pace. Sounds good, right? Well, it was. It just wasn't what I wanted it to be. I think my biggest "disappointment" (that word is a bit strong but is the best I can do) is that there were hardly any ghostly element involved. There is one point where the psychic starts having a breakdown of sorts, saying that there are too many voices calling out to her, but that's about it. Both storylines are more about intense greed and the horrific consequences that can result from that greed. Some of the characters are unbelievably depraved and do some horrifyingly cruel things, all led by their lust for riches, and I appreciated how vivid the author painted some of the terrifying and sad scenes (I felt like I could really see the people struggling in the snow storms and feel the claustrophobia of those trapped within caves). I also thought that, while the narrator did an excellent job voicing the characters, his narration was somewhat monotone and lacked the tension that the actions being described should have had (at least until the end...his voice grew in angst somewhat as the story neared its finality). Abandon was a good audiobook, don't get me wrong. It just wasn't a great one. Some of this feeling might stem from my disappointment in the fact that this wasn't the ghostly story I wanted and was expecting based on the synopsis. The past wasn't very much alive, other than in the 1893 storyline, which our modern characters obviously don't get to witness. It felt very grounded in reality and the here-and-now and, for our modern characters, the past ended up really being more of a side note to a robbery gone horribly wrong than the main driving force. I will also say that I thought the ending - of both storylines really - was surprising and quite sad. 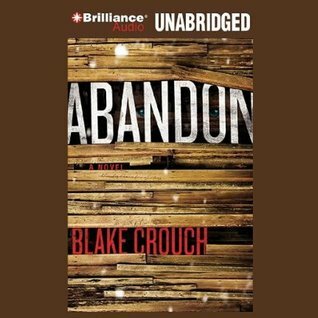 Overall, given the author's ability to transport the reader and vividly showcases the worlds he's creating, I will definitely read more by Blake Crouch. I think I just need to keep a very open mind about what the stories might actually be about. When I first saw the cover, I didn't notice the person peeking out between the wooden slats, so thought it was pretty plain. Once I saw those peering eyes I thought it was quite eerie! There's a lot of trapping and attempts at escape going on in this story, so it does fit it well. I purchased a copy of Abandon for my own library. All opinions are my own. You can find more information about the book, including other reviews and links to where you can purchase a copy, on Goodreads HERE.